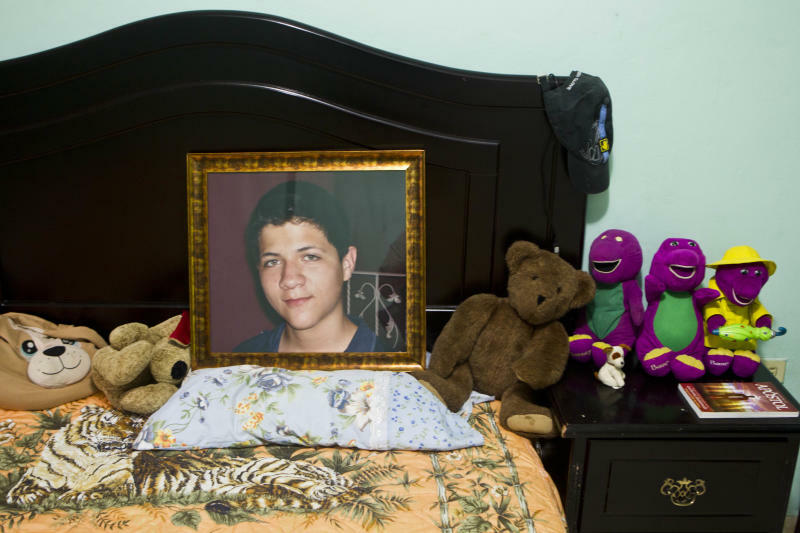 TEGUCIGALPA, Honduras (AP) — In a capital so dangerous that only the "walking dead" are said to venture out after dark, nothing could draw an obedient son from the safety of his parents' suburban home into the deserted night. Nothing, that is, but a girl. Ebed Yanes had friended her on Facebook. They had chatted and the studious 15-year-old was desperate to meet her. "My parents are still awake," he wrote her that Saturday night in May. "I'll shower while they go to bed and I'll get the keys to the motorcycle." What do homicide statistics mean to a high school freshman in the grip of a young crush? 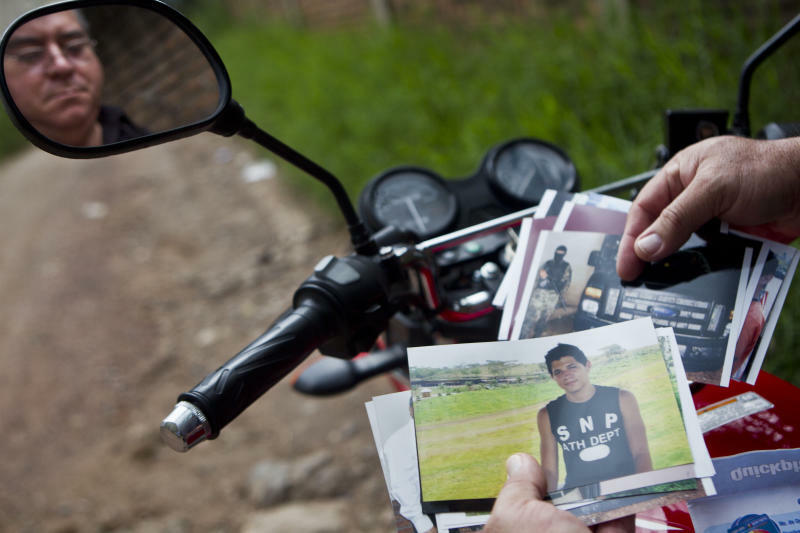 A murder rate of 91 per 100,000 residents may make Honduras the most violent country in the world, but to Ebed those odds weren't grim enough to keep him home. He crept downstairs, climbed onto his father's motorcycle and disappeared into the dark in search of the girl. He never found her. "I don't know where you are," he texted. "I've been looking for 45 minutes but now I better get back before the soldiers catch me." Police are so chronically outgunned by the criminals that the government had declared a state of emergency, allowing the army to patrol the streets. At this late hour, soldiers would have set up a roadblock. Ebed wasn't carrying the motorcycle registration, and he didn't want to be stopped, caught sneaking out of the house despite everything his father had taught him. Honduras is a broken country. The political system is so weak that just three years ago the president was ousted in a coup carried out by the army and endorsed by the Supreme Court. Poverty is second only to Haiti's in the Western Hemisphere. An estimated three quarters of the cocaine flown from South America to the United States passes through this Central American country, the epicenter of the U.S. government's war on drug trafficking. The violence, according to the World Health Organization, is "epidemic." Ebed knew he lived in a perilous country. But there was this lovely girl, and he so wanted to meet her. It was just one night. It was spring. He was young. And by 1:30 a.m., he was dead, slumped over his father's motorcycle with a bullet to the back of his head. 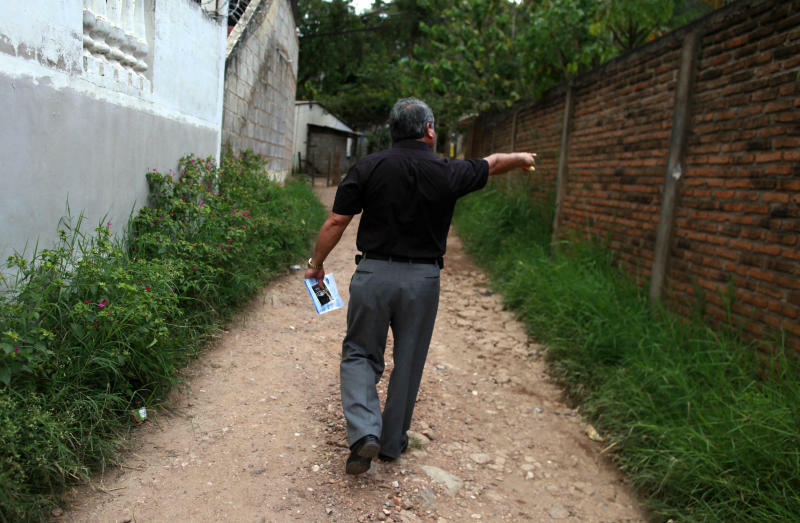 The Yanes family lives in a secure gated community on the outskirts of Tegucigalpa. Every Sunday, before going to church, Ebed's job was to wash the car for his father, an organic food supplier. But that Sunday, Wilfredo Yanes, 57, noticed that his car was still dirty. Ebed was not in bed, nor anywhere to be found. The motorcycle was missing. Wilfredo's boy was playful, fond of girls, easily distracted, but he did not get into trouble. He never left the house alone, had never taken public transportation and didn't know his way about the city. Even when he went to Tae Kwon Do lessons, his older sister waited for him in the car for two hours, studying for her medical school classes. It was hard to imagine what could have happened to him. Wilfredo called the front gate of the complex. Yes, he was told, Ebed had left near midnight, on the motorcycle. No, he had not come back. "We need to stay calm," Wilfredo told his wife, Berlin Caceres, 42, a university professor. They would look for him. They went first to the Criminal Investigations Division, where they filed a missing person report. Next they went to the Juvenile Justice Division, then to the Children's Hospital. Maybe Ebed had had a motorcycle accident or had stayed overnight at a girl's house — though he'd never done anything like that before. Maybe he would come home, apologizing sheepishly. He wasn't in jail or at the hospital. Finally, the Yaneses went to the police homicide division. The officers knew nothing about his son, they told him, but they did find a motorcycle next to the body of an unidentified young man. There had been a party in the neighborhood, they said, and somebody from the party must have killed him. "We have the motorcycle here. Do you want to see it?" The family walked across a parking lot and from a distance Wilfredo recognized his red motorcycle. He knew what it meant. "Is it him?" asked his wife. "Yes, it's him," Wilfredo said. She fainted and he barely had time to catch her before she hit the ground. At the city morgue, Wilfredo told his wife and daughter to wait outside. Beyond the bare reception area the morgue was full, well past its 45-cadaver capacity, and nearly a dozen bodies lay on the floor, each in a white plastic bag. That's where Wilfredo found his only son, with a broken jaw that hadn't even seen its first shave, and an exit wound next to his mouth. As shock set in, they handed him a bag of Ebed's belongings: his BlackBerry, a broken helmet, a set of house keys. That night, at the wake, Wilfredo stood before the family and friends who'd gathered to pray and made a promise for Ebed, and for his country too. Although deeply religious, he did not believe in leaving this horror in God's hands. God rewarded you for what you did in this life, and he had to take action. "My son will not be just one more statistic," he vowed. Wilfredo kept thinking about what the police had told him. His son was the victim of a street crime? He didn't believe it. On his way to the funeral, he took a detour to the police station a block away from where his son had been found. Two policemen on duty told him they had heard shots late Saturday, but they hadn't gone out to investigate. There were only the two of them, after all, and they were afraid. He didn't blame the officers. Wilfredo didn't care for politics or criticize the government. But he was a practical man who knew police were unlikely to investigate, and without a case the government would never deliver justice. If he wanted answers, he'd have to get them himself. He climbed back into his car and drove to the block where Ebed had died. One neighbor, a woman, said she'd heard loud gunshots, three rounds from a large caliber gun, but had been too scared to look outside. A young man who rented an apartment nearby did look, and he told Wilfredo he had seen six to eight masked soldiers in dark uniforms approaching a body. They poked it with their rifles, then picked up the empty bullet casings and went back to their vehicle parked at the entrance of the alleyway. It was an unusually big pickup truck, a four-by-four, with a double cabin. After the sun came up, residents said, they went outside and gathered bullet casings that the soldiers had failed to find. They gave them to Wilfredo, who carried them to his son's funeral, feeling the weight of their significance in his pocket and in his gut: Good God, he thought, his son wasn't killed by party-goers. He likely was shot by the army. After the funeral, Wilfredo drove to National University, where his wife worked, to see Julieta Castellanos, the president of the university. She had also lost a son, shot by police at a roadblock last year, and had become a fearless critic of police impunity. Her advice: gather evidence and then contact the prosecutor's office. Days later, Wilfredo and his wife took a drive through the hilly outskirts of the capital, past the sleazy love motels and run-down auto shops, looking for a vehicle that fit the description given by the witnesses. On their third trip, around midnight on Saturday, they stumbled upon an army checkpoint near the alley where their son was killed. The vehicle matched. It was a bulky Ford pickup. Four-door. A rare sight in Tegucigalpa. Wilfredo's wife stopped the car, and he quickly snapped a photograph, not thinking about the flash. Soldiers walked over and told him to turn over his camera. Wilfredo was terrified, but thought fast. "It's my hobby to collect photos of unusual vehicles," he told them. They let him go with a warning. It had been a week since his son's death on May 26, but Wilfredo already had witnesses, two bullet casings and a photo of the vehicle. On Monday morning, Wilfredo filed a complaint, sitting down in the office of the head prosecutor, German Enamorado, instead of waiting for a call. He wanted answers. Enamorado was impressed by Wilfredo, and if it was true that soldiers had shot and killed a high school student, well, that was abominable. Enamorado assigned two prosecutors to the case that same day. The prosecutors, however, did not have a car. The state prosecutor's office was a crowded cluster of desks and columns of stacked files. There were six prosecutors, a staff of investigators, and one car for the lot of them. The first stop was at army headquarters to collect the incident report for that night. After several failed attempts, an officer told them they had to file a request in writing. Two days later, they got it. The army's report for the night of May 26 said a man on a motorcycle fired on the soldiers at the checkpoint, but got away when the soldiers pursued him. Wilfredo's son was armed only with a cellphone. Next stop: ballistics. They asked for all the weapons from the unit that had been at the roadblock. And then came the chilling news. The soldiers were in a special forces unit of the army's 1st Battalion. The Ford was part of a batch donated by the U.S. government. The unit itself, because it used U.S. aid, had been trained by the U.S. and vetted to ensure the soldiers and leadership were not corrupt and complied with human rights laws. In other words, these were Honduras's finest soldiers. And it seemed to Wilfredo that they had murdered his son. The more Wilfredo learned, the angrier he became. The army chief, Rene Osorio, told the press Ebed had failed to stop at an army checkpoint and deserved what he got. "Everyone who does not stop at a military checkpoint is involved in something," Osorio said. On June 7, Enamorado called in the soldiers, opening an investigative file that would swell to some 700 pages. None of the soldiers remembered a man on a motorcycle, they said. Nothing happened that night. After the interview, though, one of the soldiers called his mother and told her a very different story, according to the investigative file. He had been ordered to lie about the shooting of the boy, he said. His mother called a lawyer, who advised them that it would be better to be a witness than a suspect. The soldier showed up at the prosecutor's office the next day with three others. There had been 21 men at the military roadblock. Seven more in the Ford. The two bullets that killed Ebed came from the same weapon. After that, said the soldier, the unit alerted Col. Juan Giron and received instructions. "We were ordered to pick up the shell casings and we returned to the roadblock. He told us what we had to say... that we shouldn't say what happened," according to the investigative file. Officers took the weapons the soldiers had used that night and exchanged them, to cover up the shooting, the soldiers said. When Enamorado told Wilfredo what had happened, he was aghast. "They used my son as target practice," he said. The soldiers had a choice, Enamorado said. It was right to chase Ebed, to try to stop him, even to shoot into the air. But not at a fleeing suspect. What happened next was a miracle of efficiency. Within 17 days of opening the case, three soldiers were arrested. The bullets were traced to Rodriguez, 22, who was charged with murder and imprisoned. The two others, including the officer who ordered the unit to shoot, were suspended from the army and released on bail awaiting trial, charged with covering up a crime and abuse of their office. It was a triumph, of sorts, for Wilfredo. But not enough. The man who killed his son had only been following orders. There were three officers involved in the alleged cover-up, Enamorado told Wilfredo. One told the soldiers to lie, another switched the weapons and another claimed he had never been informed of the shooting. The lieutenant colonel who allegedly ordered the weapons exchanged, Reynel Funes, had been vetted by the U.S. government. In 2006, the U.S. paid for Funes to attend the Naval Postgraduate School in Monterey, Calif., where he earned a master's degree in defense analysis. Earlier he had received training at the then-School of the Americas in Ft. Benning, Georgia. The military has denied any wrongdoing on the part of the officers. "All this about lies and switching the weapons is a novel," said army spokesman Lt. Col. Jeremias Arevalo. "We have given the prosecutor everything he has requested from the first day." "We are a responsible and serious armed force, and we are against impunity." Wilfredo doesn't think so. After months of pushing, he persuaded the prosecutor two weeks ago to investigate the roles of the officers, and to figure out what happened with the guns used to shoot his son. He has petitioned the government to take the army off the streets through a constitutional amendment. He prays his country will shake off years of corruption and dysfunction, that someday, people won't be afraid to leave their gated communities at night, and that a boy will be able to test the limits of freedom without fear for his life. He prays he will not be killed for speaking out. "I'm not only reacting to the impotence that my son's death made me feel," he said. "I can't allow for rights to be violated, and even less if it's my family's right to life." Associated Press writer Martha Mendoza in Santa Cruz, California contributed to this report.